Here is a collection of Apps that I find useful plus some links to other Apps recommended by others. Sending and receiving email is the most common task that people do with their tablets and smart phones. Most Android tablets/phones will come with a default email App. However if you use Gmail, Yahoo Mail or Outlook.com/hotmail then you should use the Apps provided by those email provides. See Setting Up email on android. Although Apps have replaced the web browser for most functions on tablets/phones you will still need to access the web using a web browser. The most common browser for Android is Google chrome. See accessing the web using Google Chrome. Read you Kindle Books on your Android tablet/phone. You will need to register the App with your Amazon Kindle account. You should note that Kindle Books purchase from Amazon are available on all devices that are registered to use the account. This means that you can read the same book on your PC using the Kindle reader as on your Android and on your Kindle itself. If you want to access another Amazon account then you will need to de-register the device and then re-register using the new account. 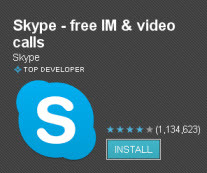 Free voice, video calls,and IMs to anyone else on Skype no matter where they are. PDF file format is an open standard developed by adobe for exchanging data reliably. The adobe reader has always been free for PCs and the Adobe Reader App for Android is also free and an essential App to install. This is a very useful App for copying Apps to other devices. I’ve used this several time as I couldn’t find the App any longer on the Play store and also when the Play store said my device wasn’t compatible. Essential App for managing your files and folders. Much simpler to use than the EFS file explorer App. Very useful App for managing your files and transferring files between Android and other devices like your PC ,Network drives Google Drive etc. Android tablets come with limited storage when compared to PCs. Many older devices have only 8GB and newer more expensive ones have between 16 and 32GB. Some tablets have a micro SD card slot which allows you to expand storage, but all tablets can be configured to use cloud storage. To use Android you will need a Google Account and all Google accounts come with 15GB free cloud storage see Using Google drive on Android. A somewhat overlooked app.Google Keep makes it easy to capture thoughts or lists for yourself, and share it with friends and family. Here is a quick review I did some time ago. This is probably my wife’s favourite. Get easy access to the daily mail online for free. If you don’t like the daily mail then BBC, CNN, Sky News,Telegraph etc all have Apps you can install. For UK users get up to date weather information for your location. If you aren’t UK based then there are many more weather Apps available like Yahoo weather. The official YouTube app for Android phones and tablets. Subscribe to channels you love, share with friends, and watch on any device. VLC media player is a free and very popular open source cross-platform multimedia player that plays most multimedia files as well as discs, devices, and network streaming protocols. You can use your android tablet or phone as a replacement for your satellite navigational system provided that it supports GPS. There are many Sat Nav Apps on Google Play store both free and Paid. The most important aspect of the App from a tablet user’s perspective is that it should work without an Internet connection. Google Maps has been popular web based application used on the desktop for route planning for a long time, and it was also the first free voice enabled SatNav App for Android. Because it requires a permanent Internet connect for use as Sat Nav I use it mainly as a street map. See Using Google Maps offline. If you like doing crosswords there are a number of very good free Apps that you will find incredibly useful. I use an App called crossword solver by David Webb to help me out in emergencies. I did a quick review here if you want more info. If you need to restrict what your kids or employees do with their tablet then there are many Apps that allow you to do that. This is another one of my wife’s favourite Apps. According to Google Play It has over 3 million users. Here is the Google play link. Incredibly useful App for finding something or finding you way in the dark and a popular feature on even old mobile phones. There are two types to choose from. The most common ones use the flash LED from your camera as a torch/flashlight. If you don’t have a front facing camera then you can use the white screen type apps that give you a bright while screen to help you see. If you use BT broadband then this app will let you connect to BT Mobile Wi-fi hotspots automatically. Do you have a favourite App? Use the comment form below and let me know. To install an App you need to go to the Google Play store and you will need a Google account. You might want to read this article – Google play store for beginners first. You can use Android to replace many common devices like cameras, sat navs. See Using Android as for lots more examples. Are you Using Google Now?